Spring training begins. The start of a new season. From April to November, baseball is our game. Finally the folks on the MLB Network will actually have something meaningful to talk about. I can start watching again. The Webman loves baseball, always has and always will. In my home town of Mt. Vernon, NY I played in the Junior Minor Leagues, the Minor League, Little League and the Babe Ruth League. I was a pitcher, catcher, third baseman, shortstop, basically played any position where the manager needed a player. I remember these days fondly. I had the privilege of playing with many great players and had terrific friendships with my teammates and many other players in the league. My father became very involved when I was young and he ended up dedicating much of his life to youth baseball, running the leagues for 34 years. He had an amazing impact on so many people and kids, I still hear from folks about the impact that he had on their life. 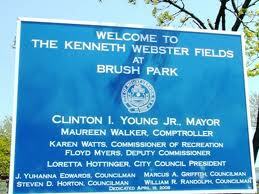 My dad’s influence lives on today at Brush Park, where he spent just about everyday of his adult life in the summers. The town recognized him a few years ago and named the fields after my father. I am very proud of my father and miss him. The game of baseball has changed so much over the years but the essence of the game has not changed at all. About a year ago, the MLB network played Don Larsen’s 1956 perfect game from Yankee Stadium. For those of you that are not baseball fans, this is the only perfect game to ever be thrown in the World Series in the history of baseball. I watched the game and the one thing that was absolutely the same was the passion, skills and strategy that is a part of every major league game. The simplicity, the harmony, the beauty of a game that looks just like the game today. 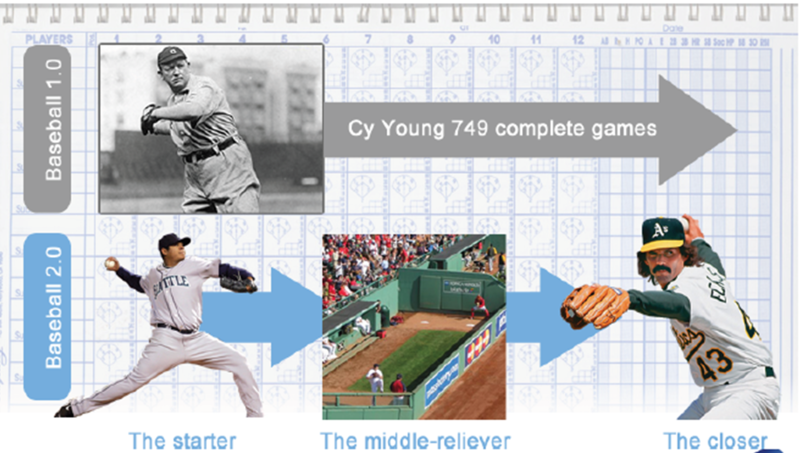 One of the areas that has changed the most is the pitching game. Years ago the pitchers basically took the ball and went out to pitch 9 innings. Today, with the exception of the best pitchers in the game, like Roy Halladay, Cliff Lee, C.C. Sabathia and a number of other front line starters, the pitching game has become a game of specialists. Most starting pitchers pitch 6 innings and then turn the ball over to the 7th inning specialist, the 8th inning specialist and the 9th inning specialist, The Closer. Within these last three innings there are also sub-specialists, such as the lefty specialist, the righty specialist, the speed specialist, the curve ball specialist, the sinker specialist and the off-speed pitch specialist. Today the leader in complete games in Roy Halladay with 66. In order to compete in the game of life, you need to change what you are doing. You need to adapt to the changing times and remake yourself continuously. You cannot be who you were, you cannot do the job the way you used to do it, you need to change or you will be no longer be successful. Learn something new, tackle your fears, volunteer for something you have never done before. If you do not try new things, how would you ever know if you are any good at them. Previous postWhile You Were Asleep…..